Quite often, when I see a pedalboard of guitarists I admire, there is a compressor pedal in the chain. How exactly does this pedal affect the sound? The benefit of a compressor lies in that every note played will be at nearly the same amplitude, and therefore nearly equal in volume. This will help normalize tones that are sometimes lost in the mix because of complex overtones, and it will result in a more articulate sound. Notice that if you don't pick all notes of an arpeggio at exactly the same pressure you will likely get a different sound for each note, especially if you are playing a tube amp. Tube amplifiers react dynamically to stronger and weaker signals--it's the allure of them--and thus the non-uniformity of picking at different strengths will be exaggerated. A compressor will fix this problem and normalize all notes of the arpeggio regardless of the player's technique and equipment, which is consequently why many soloists prefer them. Compressors also have the ability to increase the sustain of notes beyond sounds that are normally usable on the instrument; yet another reason the effect is a popular tool in the soloist's arsenal. The tiniest signal can be normalized to the same amplitude of a fierce pick attack, and a trailing note will resonate at the exact same volume until the string stops inducing a signal on the pickup. Drawbacks of a compressor mirror their benefits. More expressive musical genres such as blues rely on the dynamics of the player. Picking technique and signal volume become part of the performance itself. In this case, a compressor will nullify exactly what you are trying to preserve. However, I have seen some blues guitarists use compressors so this is obviously not true universally. Compressors also dampen the attack of plucking a string. This will make the note sound a bit squishy and with less snap. This is related to how fast the compressor reacts and normalizes the amplitude of the input signal. Slower reaction times result in a more natural uncompressed tone, while faster reaction times result in the trademark squishy sound. Some people consider the "squishyness" of a faster attack time a plus, while others don't like it. Nearly all compressors allow you to adjust this parameter, but it can never be completely transparent. You can get quite close with parallel compressor designs that blend the original signal into the affected signal, but the nature of the effect will still color the sound; that's what it's supposed to do. I feel a bit silly writing a new answer when Jduv's is so good, and so well received, but I'm going to anyway partly because I want to use simpler terms, and partly because I have a point to make about attack. Imagine you had a signal that was sometimes too loud, and sometimes too quiet. You'd deal with it by turning the volume down when it's too loud, and bringing the volume back up when it's quiet. A compressor does exactly this, except it adjusts the volume automatically, usually very quickly. At its simplest then, it takes a signal that has a variable volume level, and fixes it up so that the volume is more constant. Whether this is desirable musically depends on the player and the style of music; it is an artistic choice. Ratio - how much to "turn down the volume". For example, if the ratio is 2:1, that means that for every 2dB the input signal increases, the output increases by 1dB. Attack time - how long it takes for the effect to kick in. Release (or sustain) time - how long the effect continues to hold as the signal decreases. Knee - the shape of the volume adjustment; if you imagine a compressor as a man turning a volume knob, is he turning it directly to the appropriate position, or turning it slowly to have a less abrupt effect? Compressors are incredibly versatile, having loads of different uses. One use for the guitarist is to "clean up" the sound when the player is uneven in their playing. Another use is in extending sustain. As you strike the note, it's loud so the compressor brings the volume down. As the guitar's signal dies away, the compressor releases, so the note reaching your amp carries on. Aside from its use as a guitar effect, and its use on other individual tracks, compression is used extensively in mixing and mastering. One of the many possible effects is the "surging" effect in lots of pop and dance, where everything swells to fill the space in between drum beats. Some radio stations even apply compression to their entire output. then it slowly fades away, linearly. as the input signal fades, compression maintains it at "base" level, until there's no longer a note to work with. So it accentuates the attack of plucking the string. Alternatively, with a really short attack parameter, you could dampen the pluck. Affordable compression units have side effects on the timbre of the sound. Really high end studio equipment minimises this -- but it doesn't matter to the guitarist, because the side effects are rarely unmusical; indeed they are often pleasant. Some units are desirable precisely because of their side-effects. My explanation is more for generic compressors, but I believe it is relevant for guitars as well. As a result, the output has a thinner volume range than the input of the compressor. If there is no compression at all, the output is equal to the input. If you have -20 dB in, you'll have the same -20 dB out. It is represented by the black line in the graph. if you have -80 dB in, the output will be right above -60 dB (20 dB amplification). if the input is at -20 dB, the output will be at -8 dB (12 dB amplification). if the input is at -3 dB, the output will also be around -3 dB (no amplification). 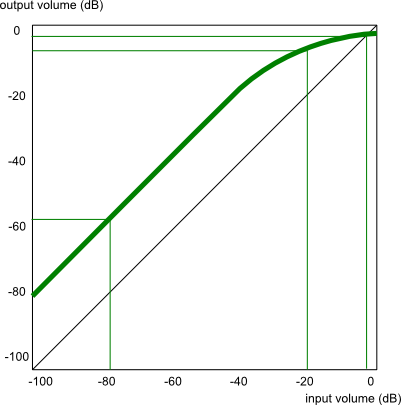 In other words, the amplification gain varies with the loudness of the input. Further, this gain is often restricted from changing too fast. This is what attack and release times are for. The attack time prevents the gain from going up to fast, while the release time prevents it from going down too fast. Limiting, is a specialized form of compression which has an "infinite" amount of reduction at a particular volume threshold. Basically, the signal will never go above this point. The amount of signal reduction applied, usually a ratio, with the larger relating to "more". Lower amounts of compression are typically used to "glue" sounds together, large amounts can be used for various effects. The "knee" of a compressor relates to how quickly the full compression amount is applied to the signal. for guitar pedals, you wont usually get to change this, but for plugins you'll be able to control how much compression is applied to signals above the threshold using this. So, using a combination of all of the above, we can shape the resulting signal. Typically for guitars (and bass), what you want to do is retain the pick "attack" but make the resulting "notes" more similar in volume. This will mean reducing very loud notes, and amplifying very quiet notes. This has the advantage of typically introducing more sustain as well as the tail off of the note will be amplified using the compressor pedal. Guitar pedal compressors typically don't provide all of the above options, opting for simplicity. its quite common that you'll only get 2-3 parameters to play with. But understanding what the pedal is actually doing will help you shape the sound in a pleasing way. usually the manufacturer will tell you the release/attack/etc timings/values that are set inside the pedal so you can work with them. Its usually recommended that you put a noise gate before your compressor (and some people put one after too) as this will help stop unwanted noise being amplified as "quiet notes" by your compressor pedal. How to play a long sustained note on an electric guitar? Chorus pedal, before or after the distortion? How do I diagnose guitar effects pedal problems?